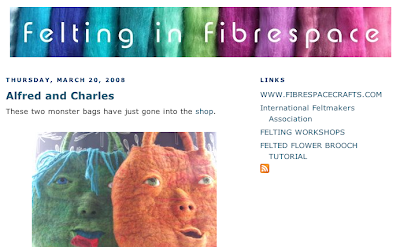 The Funky Felter: Funky's Fiber Artist Spotlight on Fibre Space! A fellow feltmaker, blogger, and Etsy seller! Funky's Fiber Artist Spotlight on Fibre Space! A fellow feltmaker, blogger, and Etsy seller! I've resolved to start highlighting some of my fellow fiber artists on a regular basis. There are just so many talented feltmakers that I've come across during my time on the internet. It would be a shame not to share some of them with you along with their wonderful blog and shop links. My first Fiber Artist Spotlight is on Fibre Space! Beth Connors is the talented fiber artist behind that name. She is based across the big pond in Harrogate, North Yorkshire, United Kingdom. Her stylish and highly informative blog is certainly impressive. It is also filled with good information and feltmaking examples so be sure to check it out! Her traditional feltmaking is innovative and truly unique as you can see in the above photo from her blog of her "Alfred" and "Charles" monster handbags. She also sells a variety of supplies for the felter including wool roving, felting kits, and dyes. You can find more of her hand felted items and supplies in her Etsy shop or on her website. I highly recommend that you go take a browse of all her sites! She is very inspiring! If you'd like to submit a fiber artist (or yourself) for a funky felter spotlight article, you can email me via my website or scroll to the bottom of the page and use my contact form. And, be on the lookout for upcoming spotlight articles! Thank you so much, and well done on being featured on the Indie Quarter blog.